I did a bit of cooking while on my short break in Wellington, my sister in law Laraine makes her own pasta and I asked her if she would show me how. She was happy to do so she said, as long as I showed her to make risotto in return! Given how much I love to make risotto this was of course a deal quickly made! The recipe Laraine uses is from Destitute Gourmet a book by Sophie Gray, which we both own. I bought this about 5 years ago and have used several recipes from it. The basic ethos of the book is how to cook well on a budget which I am always interested in! It is ridiculously cheap to make your own fresh pasta, compared to the cost of buying it, plus you know exactly what is in it! The rolling out can be a little time consuming, but I comforted myself with the fact that I was burning calories heaving the arm around and around, all the while making space for what was to come!!!! I have tried to hunt out my copy of the book and no search on the internet has thrown the recipe up either so from memory...it is simply 2 c flour and 2 eggs, blitz it in the food processor until it looks like breadcrumbs and just starts to come together, then tip it out onto the bench and bring together as you would pastry. Knead it for 8-10 mins until it starts to feel quite smooth. Jamie Oliver's recipe uses 220g flour and 2 eggs and he suggests leaving it to rest in the fridge for about half an hour. We didn't do this, but I will next time, as I think it would have improved the texture and workability of the pasta. We dropped a few sundried tomatoes into the processor and whizzed that in too for colour and interest. Then it is just a case of rolling it through the pasta machine as sheets (which we did first) or fettucine (as we did as well!). I soooooooo want one of these machines now!!!!! 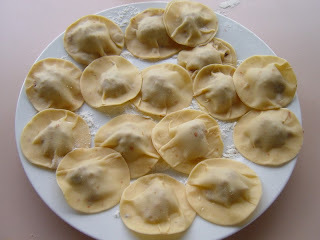 We decided to make ravioli out of the sheets, using a cookie cutter for discs of filled pasta. We filled one with beef, bacon and mushroom, and the other with blue cheese and caramelised onion. They were reasonably easy to make, a definite Saturday afternoon type of cooking, where you take your time and get engrossed in it! 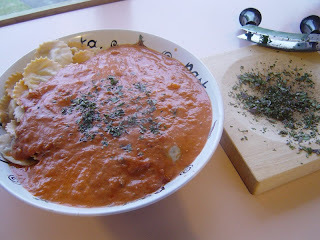 We made a basic tomato sauce finished with cream and fresh herbs and I have to say it was extremely delicious. I want to do this again soon! 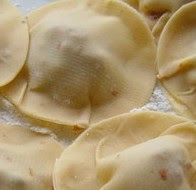 Your mezzaluna looks exactly like mine- aren't they handy devices? 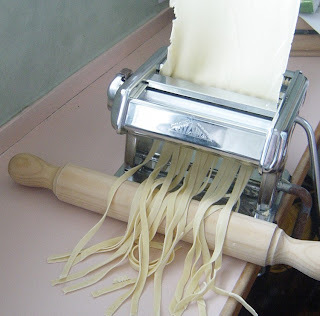 I love homemade pasta - I only make it occasionally, but it is always worth the mess and effort! Yours looks absolutely GORGEOUS! Sounds like you had a very culinary time in Wellington! Hi Linda, your ravioli looks delicious, very inspiring! !